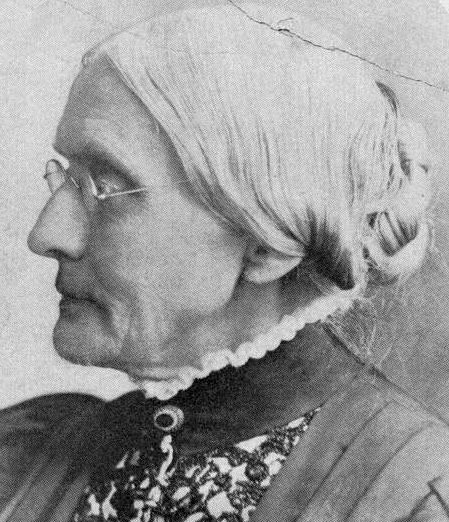 "Any man who voted against female suffrage was a blockhead," Susan Brownell Anthony declared in an address to 45 men, 12 women, and a few boys at Manhattan on September 7, 1867. Although several of the men disagreed with Anthony, few attempted to argue with her. Questioning her femininity, The Kansas Radical, in reporting the event, wrote that the men were unsure of what she would do if cornered. Later in her speech, she modified her blockhead remark to exclude farmers. Anthony, the oldest of seven children, was born in West Grove, Massachusetts. Their father, Daniel, was a member of the Society of Quakers. He and their mother, Lucy, expected self-discipline and high principles in the children. The family moved to New York when she was young. The Panic of 1837 brought hard economic times and Susan began teaching as a way to help with the family debt. She fought against the gender inequality she experienced as a female teacher in a man's world. By 1849 she began to be involved in antislavery, temperance, and women's movements. Overcoming a lack of confidence in her appearance and speaking ability, Susan developed a following among women across the nation for her leadership. She and Elizabeth Cady Stanton founded the National Woman's Suffrage Association. Anthony's brother, Daniel R. Anthony, moved to Leavenworth, where he became active in the antislavery movement. The question of whether Kansas women should have the right to vote was debated at the Wyandotte Constitutional Convention in 1859. With the passage of that constitution and Kansas' admission as a state, women were given limited school suffrage in 1861. In 1867 Anthony and Stanton began campaigning in Kansas to support full women's suffrage in Kansas. Despite their efforts and those of many others, a constitutional amendment for full suffrage was voted down in 1867. In 1879 Anthony was in Topeka to deliver a speech on women's suffrage. 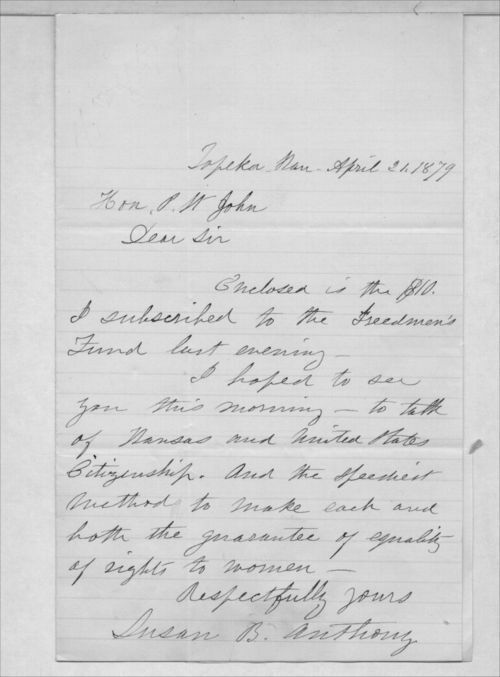 In a letter she wrote to then Governor John St. John, she mentioned she had hoped to see him at the speech, and she enclose $10 for the Kansas Freedman's Relief Association. Kansas women were able to acquire municipal suffrage in 1887, but supporters continued to fight for full suffrage. In 1888 and 1889 Anthony attended the annual conferences of the Kansas Equal Suffrage Association. She returned to Kansas in the summer of 1894 to campaign for an equal suffrage amendment. Supporters spoke at the sweep of 100 two-day mass meetings. Again, in spite of their efforts, the amendment was defeated. The latter finally was achieved in 1912, when voters passed the woman suffrage amendment to the state constitution. Anthony did not live to see women finally achieve full suffrage in 1920. She died 14 years earlier.